We love the flavor of purple potatoes. They are so rich and earthy. Wash and prepare the potatoes. Melt the vegan margarine and olive oil in a soup pot. Add the leeks and gently sauté. Add the vegetable bouillon and sliced potatoes. Add the garlic and bring the soup to a boil, then turn down to a simmer. Cook the soup until the potatoes are soft. Puree the cooked soup. It will be very thick, so thin with the white wine. Add the salt, white pepper and rubbed sage and again puree. At this point, if you want, you can add soy cream. We were very happy with the soup so only used soy yogurt as a garnish. 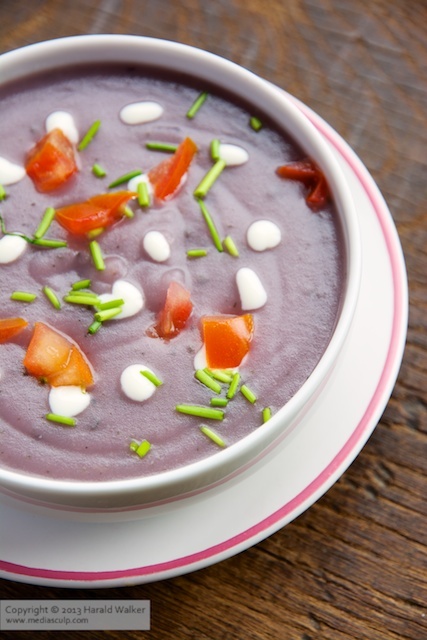 Serve the soup garnished with soy yogurt, chives and possibly with tomato pieces. Posted by Chris Walker on January 2, 2014 in Leek, Potato, Soups.